Our building work and home renovation covers every domestic build you can think of including re-fits, loft and garage conversions, extensions, new builds and hard landscaping. We provide a comprehensive building maintenance service as well as carrying out re-fits on pubs, shops, offices, restaurants, schools, hospitals and other commercial buildings. We have an established track-record in the provision of industrial buildings, including design, construction, refurbishment and alteration works to existing premises. We specialise in a range of civil engineering and construction services including design and planning with a solid reputation for high standards of workmanship and completing on time and to budget. P & D Gudger is a family run, North West based building and construction company. Offering a comprehensive range of building and groundswork across the North West including North Wales, Flintshire, Wrexham, Chester, Cheshire, Wirral, Warrington, Liverpool and Manchester. Services are offered to all sectors including domestic, commercial, retail and light industrial. 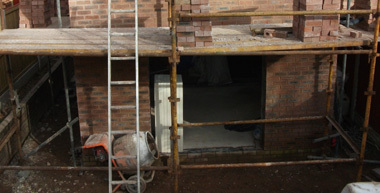 If you require a local builder, don't hesitate to get in touch. We look forward to hearing from you.